A new standard in four-strokes from Suzuki. 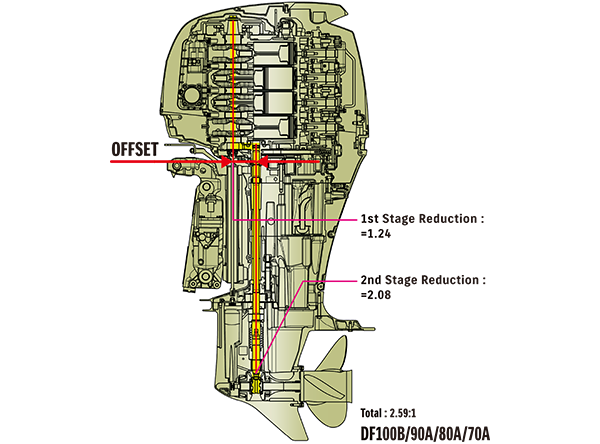 The engine powerhead is positioned closer to the front, moving the outboard’s center of gravity forward. 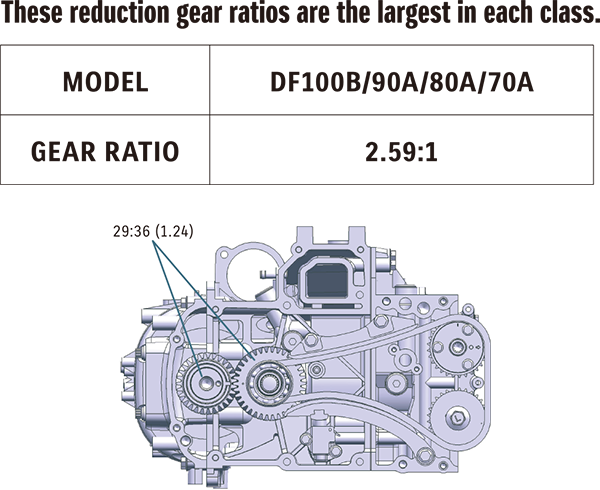 This system which incorporates the Offset Driveshaft features a first stage reduction between the crankshaft and drive shaft and a second stage reduction inside the gear case. This design makes a larger gear ratio possible, allowing it to turn a large diameter propeller for high propulsive efficiency while providing higher torque. Tremendous power to turn large diameter propellers, offering quick acceleration. The Lean Burn Control System supplies the right fuel and air mixture depending on the navigation conditions. Significant improvement in fuel economy in all speed ranges especially at cruising speed. Fuel costs can be saved thanks to improved fuel economy. The Suzuki easy start system no longer require to hold the key until the engine start. Now simply turn the key and release and the starter will stay engaged until the engine starts. The system also features more precise cylinder detection, fuel injection, and ignition control to deliver smoother and improved starts, more efficient combustion, and greater fuel economy making the outboard more environmentally friendly. The lower gear case on all four outboard motors utilizes a hydrodynamic design. As the lower unit moves through the water its sleek form reduces drag by up to 36% compared to conventional designs, contributing to faster acceleration and increased speed. 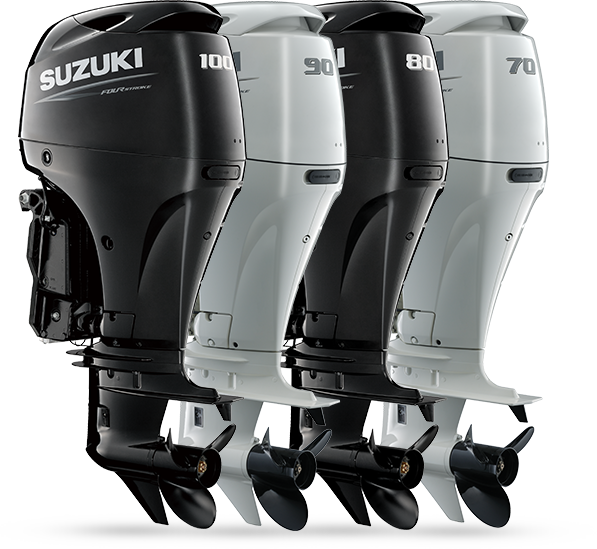 Thanks to the powerful torque delivered with Suzuki’s two-stage gear reduction, these outboards can turn a large diameter propeller. Suzuki engineered a new highly efficient propeller that takes advantage of this torque to provide faster acceleration and higher top speed. The timing chain runs in an oil-bath so it never needs lubricating, and is equipped with an automatic hydraulic tensioner so it remains properly adjusted at all times. Higher durability compared to belt types. It helps protect the engine from water in the fuel using a water detecting fuel filter to alert the operator with both visual and audio warnings when water is present in the fuel. Bonding the finish to the outboard’s alloy surface our specially formulated anti-corrosion finish has long been used as an effective treatment against corrosion and is found on all of our outboards. A tilt limit system that prevents the outboard from tilting beyond a certain angle. 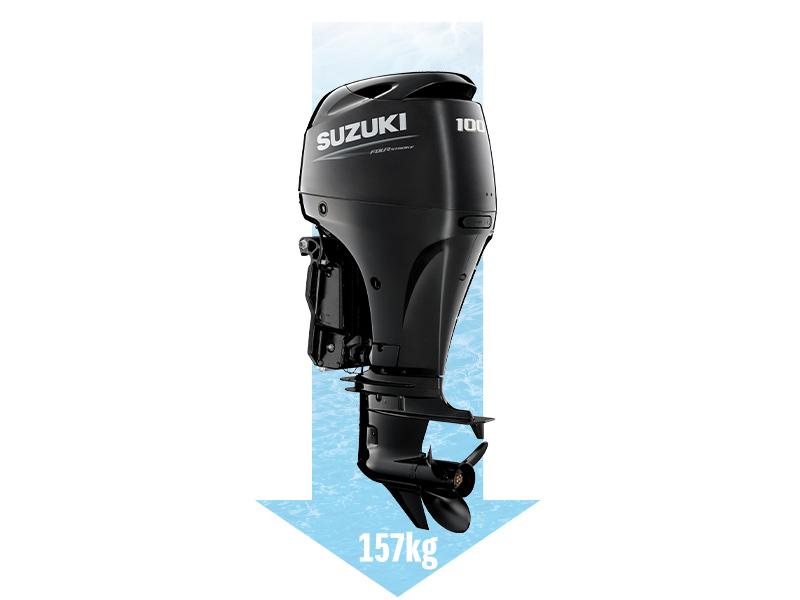 Prevents damage to the boat or outboard due to excessive outboard tilting. A system that can move the boat at a constant speed. Boat can be moved at a constant speed without operating the throttle. Over time, salt, sand, and dirt build up can restrict flow in the cooling system causing damage. To help prevent such buildup, DF100B/90A/80A/70A are equipped with two freshwater flush ports that make flushing the cooling system much easier. With one port located on the port side of the down housing and a second on the front panel, you’ll always have easy access to the flushing system whether the boat is in or out of the water. The appearance, colors, and equipment of outboard motors may differ according to market and grade. Specifications may change without prior notice.